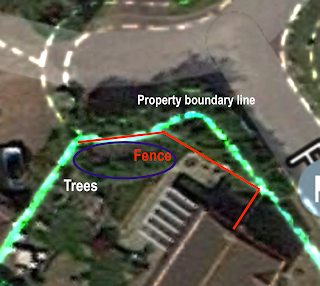 We finally got around to sorting our boundary to our garden. It was a wooden fence and some tall trees. We got rid of the trees ages ago, and now the fence was starting to fall down in strong winds. Not ideal. What always puzzled me is why the fence was where it was, it did not follow the road. So I got the plans from the land registry and overlaid on to the aerial image of the road (in green on this image), and realised I had a big chunk of garden that was outside my fence! So, we decided to clear out the bushes and the old fence and have a nice wall... Well, that was the plan! Now, I am sure we could complain, or sue, but is it worth the hassle? It does piss me off. We were going to use them for the patio and a low wall in the garden, but found someone better. I'll do a blog on them soon. It always pays to inspect a builder's previous work. If they are unwilling, walk away. From the picture it doesn't look very safe; it looks like a good shove would knock it over! Take a look at https://www.gov.uk/guidance/your-garden-walls-better-to-be-safe for guidance, and if it falls short you may have to demolish and start again. If I'd missed the earlier part of the post, I'd have thought RevK had put that wall up himself, after a bit too long at the man-cave bar! Maybe it is safe, maybe it's just a trick of the light, but like DougM says, that brickwork looks seriously off. Well, it is double skin, and curved, so should hold up, but a tad shoddy really. 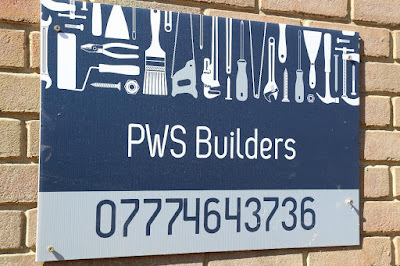 I have to admit I also find it hard to trust tradespeople who use an @btinternet.com email address or equivalent. I'm interested in how that wall is 'double skinned' - you'd expect to see the end of bricks ('headers') in a 9" brick wall, tying the back and front halves together. Did he/she just build two 4.5" brick walls next to each other? I think you've been had. 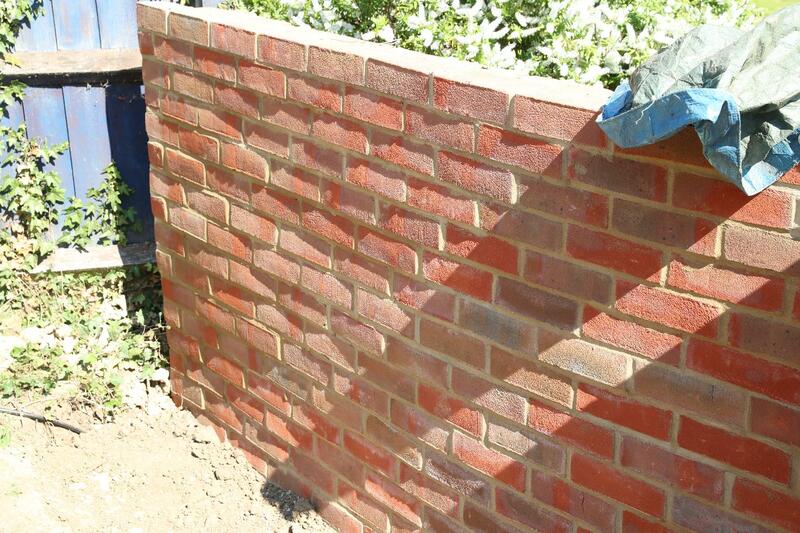 Its a standard stretcher bond & is held together with wall ties - or it should be. As I can't see any DPC or any coping I have my doubts as to whether the builders are competent enough to have fitted them. If there's no wall ties then the wall is potentially lethal and you're liable for it, not them. I recommend you get a structural engineer in to take a look at it. I certainly wouldn't have paid for crap work like that, dunno why you did? That wall is not safe or properly constructed. I would insist they come back and fix that (eg start again), or I'd take further action. That's a shoddy pile of bricks and is going to cause an injury sooner or later. Dreadful work. One mobile number makes "PWS Builders" mean "PWS Builder plus some subbies who only care about the paycheque". I agree with jas88's mother and also knewt (especially when they have their web address in the form www.whizzbangbuilders.co.uk and an e-mail of whizzbangbuilders@aol.com!). These days it's not hard or expensive to 'do things properly' and choosing not to says "I don't really care how I appear and the same probably carries on to the quality of my work". Or, to be fair, "I've been a builder for forty years, I don't know or care about this Internet stuff, but my sister's kid sorted it out for me, can I go back to laying bricks now". Exactly my experience with a local painter/decorator - he's been doing it a long time (something either side of 20 years? ), very professional, proper landline number - but sends all his quotes on paper not email, and his address is still @btinternet.com. Since he's got a six month queue of work booked up, I don't think it's hurting his business at all, so why would he change? He should change because it is unprofessional and unacceptable in 2017. Wow, bit of an overreaction, there. I'm sure with a 6 month waiting list, he's not going to be missing your business. Assuming you're not just trolling. "He should change because it is unprofessional and unacceptable in 2017." Says the person posting anonymously - max irony. FFS I think I could build a better wall than that and I am borderline dyspraxic and my DIY "skills" include being able to align things at any random angle other than actually horizontal or vertical and drilling holes almost anywhere but where they are supposed to be. You'd think that by chance I'd occasionally get it right but it doesn't seem to work out that way. There is something quite odd about the layout - for a stretcher bond the bricks should line up on alternate courses but those seem to be all over the place. Also, for a double skin there should be ties between the skins and, usually, capping bricks, or blocks to stop water running into the wall (and also add a decorative finish). I agree with those who said they would not have paid for work of this "standard"
Dear OFCOM, can we play this game too?